Besides all the other impressing stuff that I`ve seen at Revision 2015 this cute little demo really means something to me. It is my personal favourite from the party (plus the Zen Fox Gif animation and the MmcM Spectrum music disc). 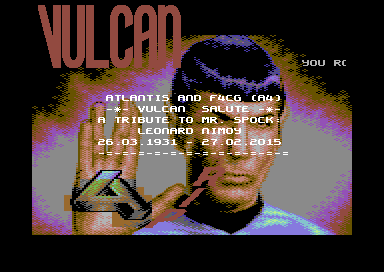 Thanks Atlantis, for honoring Leonard Nimoy! The melodic sad tune and the iconic picture of the actor (and Vulcan =) ) Leonard Nimoy create a dignified memory. Agreed, the Spock reference is cool. I saw Leonard Nimoy in his last Star Trek cameo just yesterday. Due to the films and references by his fans, Spock will live forever! Please replace the current screenshot with this one, too. @dmd: I`ve put all the changes you desired into the "fix me" pipeline. loved seeing this on the big screen... shoulda ranked higher IMO!